What do you want to track? Fitness trackers generally cover the basics well enough, but some are designed to work in more situations than others. Waterproof or water-resistant models are growing in number, making it possible to track swimming and aquatic activities. Built-in GPS can measure distance, pace and cadence on a run. Multiple trackers in one unit can hone in on muscles in real time. What type of fit or design are you looking for? Not every fitness tracker looks or feels the same. Smartwatches are a unique category because of the way they run apps, but wristbands are the most common style of tracker overall. Whether you want to wear one all the time or are looking for something to use only when exercising, there are general and use-specific models available. How accurate are fitness trackers? Step tracking will always be more accurate with a pedometer attached to your foot, though trackers have been getting better. You may need to adjust for stride length to calibrate it to your height. Pace, distance and cadence measurements are only as accurate as the location-based signals allow via GPS. Heart-rate monitors can also vary. Some trackers also let you manually input information, including water intake, food consumption and weight, for a more holistic approach. Sleep tracking might also be included to assess the quality of your sleep. Will you always need to have your phone with you? That depends on the tracker. If you want to measure distance or a route with a tracker that doesn't have built-in GPS, then you'll need to bring your phone along. You may want the phone to play music while you exercise since most trackers have no onboard storage or native music streaming. A tracker can measure other things without the phone to sync over later, though it would be limited to the basics, like steps, calories, active minutes and heart rate. How long do they last? Fitness trackers are exposed to sweat and, often, to the elements. Swimming and other sports or physical activities could also test their endurance further. Battery life usually maxes out at five to seven days, meaning you'll need to charge the tracker often if you use it daily. 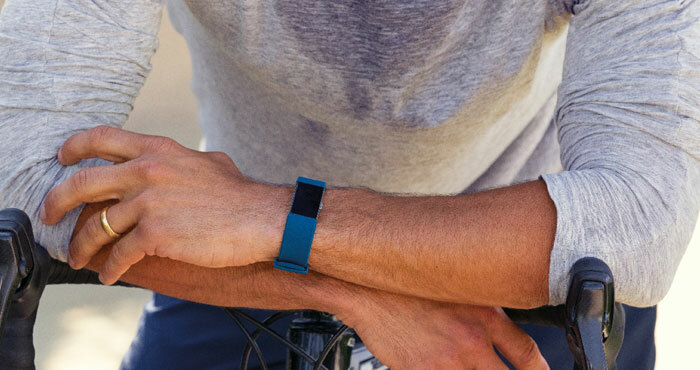 Here's a look at our top picks for fitness trackers. Fitbit has a full lineup of fitness trackers, including the Ionic — a smartwatch — but the Charge 2 is arguably its best all-around device. It's essentially a blend of the previous Charge and Charge HR with extra functionality built in. The main physical differences are the 5x larger OLED screen and interchangeable strap mechanism with stainless steel buckle. Functionally, the Charge 2 tracks the primary metrics, including steps, calories, active minutes and stairs climbed. It does track distance when paired with a phone, and adds multi-sport tracking for specific activities. Then the Charge 2 takes everything it tracks and gives a holistic cardio fitness score. The PurePulse optical heart rate monitor in the Charge 2 differs from previous models in that it can continuously measure beats per minute. Fitbit also offers a guided breathing exercise for relaxation. With the improved accuracy and durability, coupled with the excellent support on the Fitbit app for iOS and Android, the Charge 2 is effective for users of all stripes. Other products in the Fitbit ecosystem, such as the Aria 2 WiFi smart scale, for example, can also funnel information to the app to cast a wider light on health feedback. Given how subjective user comments on fitness bands can be, this model has received overwhelmingly positive feedback. The larger display does make it easier to navigate the various features, though it's no substitute for the extra space a smartwatch provides. Key phone notifications — incoming calls, text messages and calendar alerts — can run through the Charge 2 as well. Third-party app notifications won't go through. Interchangeable band options include genuine leather and stainless-steel bands from both Fitbit and third parties. Where an accurate heart rate truly matters, a chest strap —which uses electrical signals rather than light to measure heartbeat — is arguably the most effective method. And monitors strapped over the chest can keep tabs on more than just heart rate, pulling in data that can provide more comprehensive fitness results. Polar has been the leader in this category for some time, and the H10 strap is the latest and greatest in its lineup. Despite being a newer contender, Wahoo has created a stellar competing device with its Tickr X. They're so evenly matched that it was hard to select one as a clear winner over the other. The H10's sensor is smaller and thinner than its predecessor, with electrodes and silicone pads to maintain placement on the skin. It's waterproof, so it can be used while swimming. No matter the activity, the sensor's built-in memory can record data for one workout to sync over to the mobile app afterward. Thus, no need to carry your phone for the H10 to track anything. Polar's GymLink technology can send heart rate data to compatible equipment to offer real-time feedback. The Beat and Flow apps are free to use, but require payment to unlock all their features. Third-party apps such as Endomondo, Cardio Mapper and Runtastic are supported, though the list isn't extensive. Wahoo's Tickr X has more technology packed in, despite lacking a waterproof body, which precludes its use in water (though it is IPX7-rated against sweat or rain). The strap has a unique snapping system that makes it easy to put on, and the sensor itself can vibrate or light up based on customizable feedback. It uses both Bluetooth and ANT+, making it compatible with a range of fitness products, including legacy ones that solely use the latter protocol. Android and iOS support is extensive, as is third-party app compatibility. Other apps like 7-Minute Workout, RunFit and Beachbody on Demand will track reps, pace, cadence, stride, vertical oscillation and ground contact on top of heart rate. Some of this tracking applies to indoor workouts on treadmills, bikes and elliptical machines too. 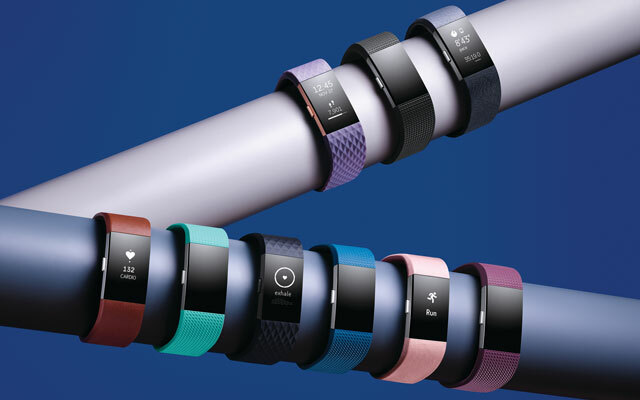 This is a hotly contested fitness tracker subcategory, with capable and compelling options on the market from various brands including Garmin, Polar, Suunto and Epson, among others. The Spark 3 Cardio + Music stands out for its combination of features, compatibility and price. Designed with runners in mind, it has built-in GPS to track routes along with distance, pace and cadence. Waterproof with sensors inside, the Spark 3 can also track swimming, cycling, gym workouts and more. That's great versatility for runners who cross-train. Route Exploration, one of the Spark 3's key features, lets you create running routes and upload them for a map view. The map is displayed as a line that thickens along the route, and you can view the start or finish anytime. 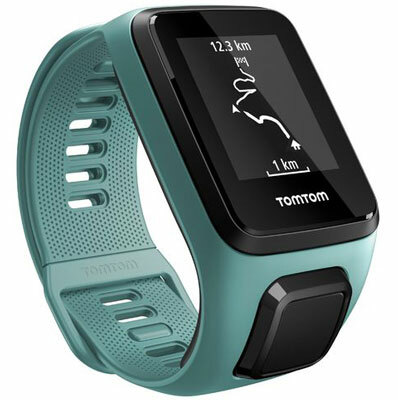 The TomTom MySports app for iOS and Android is the primary data driver, though you can glean more from the MySports Connect application for Windows PC and Mac OS. There's also a browser-based dashboard available to view progress. Third-party apps are supported — MapMyRun, Runkeeper, Runtastic and Strava are among the standouts. The watch doesn't accept phone notifications, so calls, texts and other alerts don't pass through. The music side of the equation is more complicated than it should be: You'll need MySports Connect to upload tracks and create playlists to play off the Spark 3 itself. On the Mac, you must set it up using iTunes. There's room for roughly 500 songs. There are four versions of the Spark 3; the Cardio + Music is the most expensive. If you don't need the music, the Spark 3 Cardio is a more economical option. For those who are more serious about assessing progress when pumping iron or going hard at the gym, the Athos Training System is designed to target muscle activity in real time. 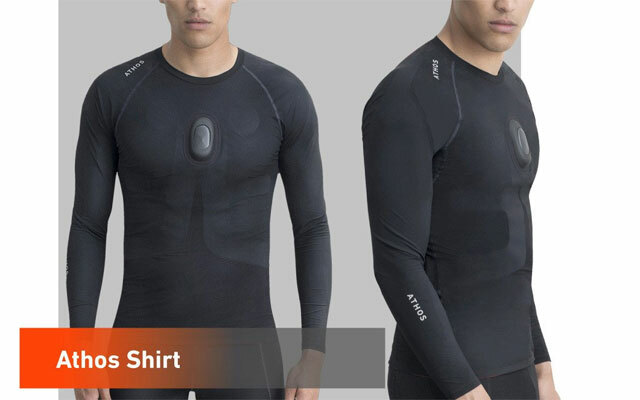 The system comprises a compression shirt and shorts lined with gel sensors that connect to a module called the "Core," which reads muscle activity during exercise. There are both EMG (electromyographic) and heart-rate sensors inside, plus a respiratory sensor inside the shirt to measure beats per minute. An accelerometer and gyroscope are included to better track movement as well. The Core can snap into a holster on either the shirt or shorts. 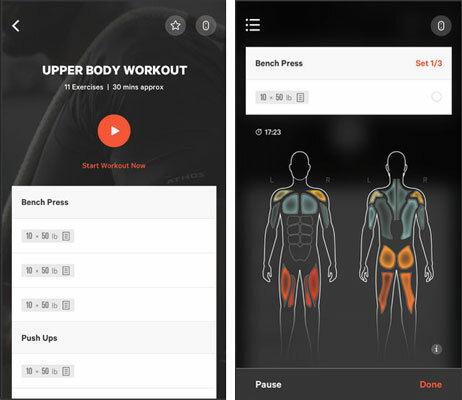 It's possible to have two Cores at once to track upper and lower body workouts, though you'll have to buy the second one separately. The Athos app for iOS (Android isn't yet supported) displays the activity through color-coded graphics. Blue indicates light activity, yellow and orange are in the middle, and red means heavy. So you don't have to stare at the phone during reps, the app can record the set for playback during rest periods. While heavy on coverage for the upper body, Athos doesn't have compression pants for men to measure calves. There are leggings for women, but they don't have sensors for calves. Neither the shirt nor shorts have sensors for the abdominals and hips, though glutes are covered. Despite the drawbacks of the Athos system, it's been used by professional athletes to help gain strength, as well as to rehab injuries more carefully. It might also motivate otherwise-lazy gym members to get more use out of their memberships. Both the shirt and shorts are washable on gentle cycles in cold water, but the Core must be hand-washed. My wife had a fit bit. The problem we found with the fit bit was that the band and other rubbery pieces started to peel away leaving the “works” vulnerable. There’s no way to replace the band, either, so there was no way to repair the item. The fit bit is a little too expensive to be disposable because it can’t be fixed. My wife has switched to Runtastic. It’s more of a watch-type item. The band can be replaced if needed, because it is separate from the “works”. I think this is going to work out for her. We’ll see what it’s like next year. The Charge 2 mentioned in this article has a replaceable band. I had a number of the Flex’s and the original Charge and they did exactly what you mentioned your wife’s did but this Charge 2 seems to be of a better quality - many times over.